Routed into finished maple (so the wood grain is visible), this maple Cretan finger labyrinth is one of the oldest (4000 years or more), simplest and most widely used labyrinth pattern in the world. It’s name was derived from an early representation on the Isle of Crete. It is also referred to as the Classical 7-Circuit design and can be used as a template for the seven major energy centers of the physical body known as Chakras. Understanding the quality of each of these energy centers as it relates to a specific path or circuit on the design, assists you to consciously gain insight into and ferret out answers to the complexities of life. 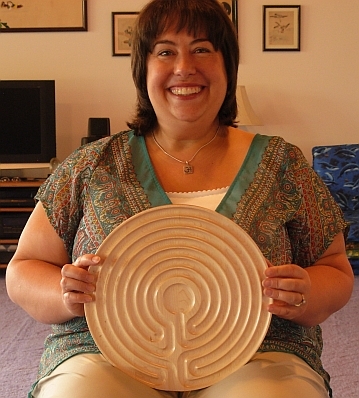 The maple Cretan finger labyrinth looks like the cross section of a human brain and has therefore been used effectively to assist those with Dyslexia, ADHD, neurological disorders etc. Being 12″ round, and weighing about 1 lb., this labyrinth fits into briefcases, suitcases and is the perfect take along. It is also a tool for those who may lack strength and mobility such as small children and nursing home residents. 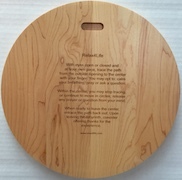 The design has a wide finger path, engraved suggestions for use and a notch for hanging on the back. This finger labyrinth or lap labyrinth functions in much the same way as a full-size walking labyrinth, (to further relaxation, meditation and prayer) except that the user traces the path to the center using their finger rather than their feet. For many, this combination of movement (tracing the path) with introspection (eyes closed), is a more relaxing way to meditate or pray. 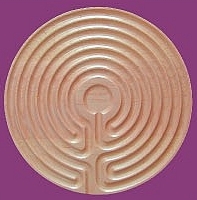 For those whose meditation or devotional practice seems demanding or sporadic, finger labyrinths provide a unique way to bring renewed vitality and meaning to these activities. Since 1997, we have been making this maple Cretan finger labyrinth design with wide, adult-sized finger paths. Due to the clear finishing, it can only be lightly sanitized between uses (using gentle soap and water). If more extensive sanitizing is required (such as in a hospital, nursing home, elementary school etc. ), we recommend our finger labyrinths made from food grade, commercial plastic material.